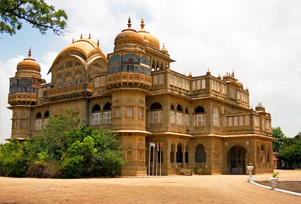 Close to the beach of Mandvi is Vijay Vilas Palace, an impressive Indo-Edwardian pile. This 20th-century summer palace was commissioned by Maharao Shri Khengarji III for his son Yuvraj Shri Vijayaraji, who was also the heir of his kingdom and is therefore named after him. Maharao Shri Khengarji III inherited the throne from his father, Maharaja Pargmalji II who built the Parag Mahal. Construction of the place was started off in 1920 and its structure reminds one of a large English country house. Made of red sandstones, the palace features every element of Rajput architecture and bears a striking resemblance to palaces of Orchha and Datia. Artisans from various parts of India, such as Rajasthan, Bengal and Saurashtra along with the Mistris and Suthars of Kutch were called upon for making of the palace, as a result of which traces of different religion aesthetics are reflected in the palace. Originally a summer abode for the Kutch rulers, its 1st floor is now the erstwhile royal family’s residence. The palace also has a private beach with luxury tents that can be rented out by the tourist. Since the palace has been well-preserved, it also used as a background for many Bollywood feature films. A portion of the palace is now converted into a resort, offering accommodation options with an ethnic decor and is replete with modern amenities. Inlaid tile work, distinctive stone carving, manicured garden, intricate jail work, magnificent water streams and murals are the highlights of the palace.